Simply staged, beautifully sung and deeply affecting, Classic Stage Company’s Passion is the jewel of the current off-Broadway season. The absence of co-star Melissa Errico, sidelined for the remainder of the run by bronchitis, is unfortunate, but the tight ensemble cast nonetheless perform as one, with the kind of understated flair rarely seen on Broadway. 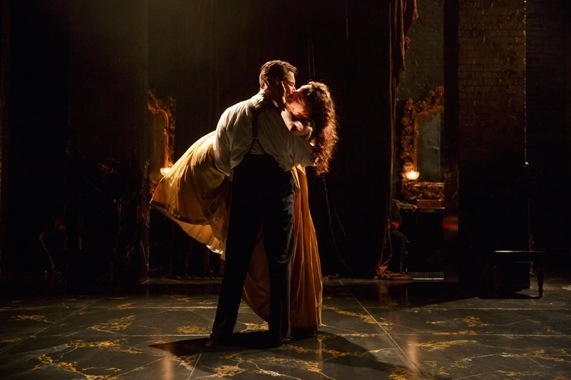 Arguably the most intricately psychological of Stephen Sondheim and James Lapine’s collaborations, Passion is the type of complex piece of musical theatre which soars when done very well and sinks in all other cases. And this production has been done very well. Noted Sondheim interpreter John Doyle sets aside his actors-play-the-instrument concept to direct and also design a stripped back production that allows all the passion to be viewed in its rawest state without the added details of scenery and props. The action unfolds on a glossy black marble stage, its edges showing the effects of decay and disrepair. The central conceit of the narrative is that it unfold largely through letters between the three pivotal characters of the unusual love triangle. 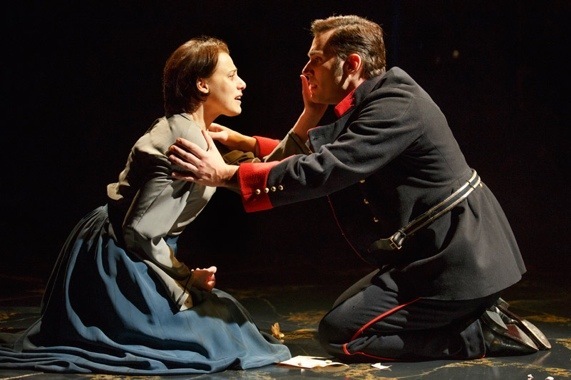 Handsome military captain Giorgio corresponds with his gorgeous lover Clara while finding himself continually drawn to, and drawn in by, the sickly Fosca. The initial apparent revulsion of Giorgio for Clara breaks down as he finds himself ever further torn between the two dramatically different women. Doyle achieves an effortless flow, in which the one-act show unfolds like a single-reel movie. Scenes are superimposed with perfect clarity, the tension building as events appear to unfold literally under the noses of characters who are actually miles away. Placement of the actors has a precision usually reserved for complex dance choreography, with further unison achieved by the consistent level of performance given by each player; no one stands out or draws attention at any time. A highpoint of the ensemble is the re-enactment of Fosca’s past, in which the male ensemble play multiple roles most effectively. Rob Berman has prepared the music with the same level of seamless integration, the fiendishly difficult score sounding as naturally straight forward as a lullaby. The absence of props works well in all instances except for the opening bed scene where Giorgio and Clara have to make do with lying on the floor. There may be little or no props, but there are beautifully detailed costumes by Ann Hould-Ward. Ryan Silverman has the height and handsome good looks to be a dashing Giorgio. His speaking voice has a plummy tone fit for a noble captain and his singing voice is just as ideal for the role. Silverman expertly captures the torment and indecision of Giorgio, his body exhibiting Giorgio’s stress with physical changes as the performance unfolds. 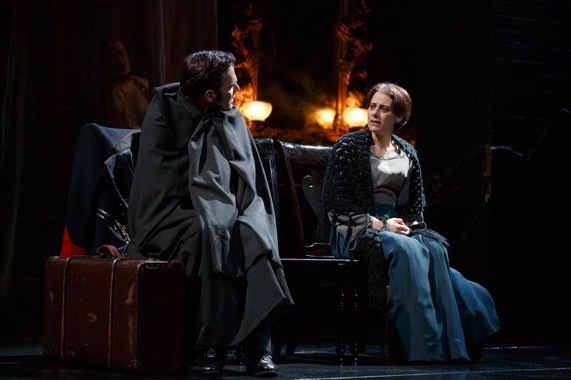 Highly experienced leading lady Judy Kuhn gives a richly detailed showing as the enigmatic Fosca, her achievement being the quality of performance without resorting to any level of dramatic affectations. Kuhn’s Fosca tests our levels of empathy, giving us virtually the same dilemma as Giorgio in terms of clarifying our feelings for her. Amy Justman recently assumed the role of Clara having begun as an understudy to both female leads. Young and blonde with a pure beauty, Justman is a natural Clara, her youth a natural attraction for the passionate Giorgio. If Justman lacks just a little of the stage experience of her counterparts, she nonetheless sings the role beautifully. After sitting through the overblown hollow spectacle of shows like Motown, Passion is an oasis. The forthcoming cast recording is eagerly anticipated. 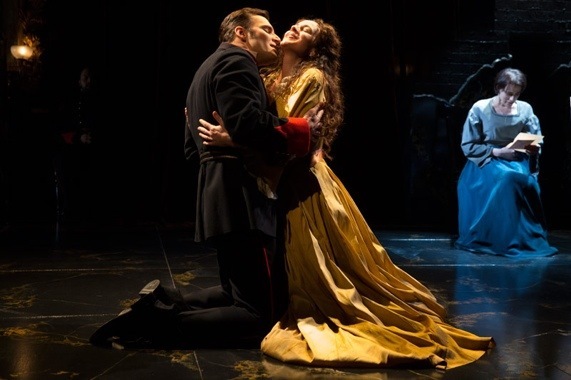 Passion continues at Classic Stage Company, New York until 19 April 2013. Oh my goodness, your planning ahead to see this paid off. I love the CSC setting and the run totally sold out! I didn’t get to see it because I was deep in rehearsal for I Lombardi. Hi Grace, yes this certainly did take planning, in fact it was the only musical I booked in advance before coming across from Australia for my recent visit. I didn’t realise until later that this was the first time this group had done a musical – what an amazing achievement. Speaking of amazing achievements, it’s disappointing that your commitment to I Lombardi kept you from seeing Passion but what a truly wonderful result you achieved for all those rehearsals. I think I would actually rate Passion and I Lombardi as my two highlights of the 20 shows I saw on this trip.